​Tesla Model S P85D: Is This Elon Musk's "D"? Elon Musk teased us with his "D" last night, and now we've got our first glimpse of what could be the Tesla Model S P85D. 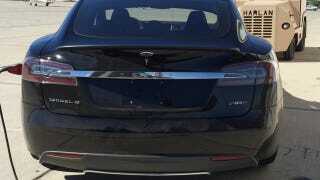 Spotted at an airfield by a Tesla Motors Club forum member, the P85D badging on the back looks legit. But there's still no word on what it means. The smart money is still on a dual motor version of the Model S, cribbing the all-wheel-drive system being developed for the forthcoming Model X SUV, which uses the sedan's underpinnings. An AWD Model S would be great for northern climes and snowy winters, but the performance benefits could be substantial. With another electric motor, we could see the 0-60 time drop below the 4.2 second mark of the current Model S, but the extra weight could negate quicker acceleration – not to mention range. The current Model S' motor comes in at around 350 pounds, but it's doubtful that Tesla would simply use the same motor that's powering rear wheels. Something smaller – and lighter – is likely being used for both the P85D and the Model X, and we'll know more next week in LA – we just got an invite for the event on October 9th.